At Ten Thousand Homes, we’ve had a growing awareness that we need to know the children beyond the feeding programs. This is challenging because talking about home-life, need or revealing parts of your story are cultural no-no’s here. TTH visitor, Lindsay Loveless helped bridge this cultural gap as her heart broke for 7-year old Siyabonga. She sent a suitcase full of winter clothing and shoes to replace the tattered items he pieced on every day. 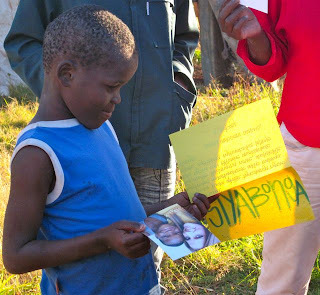 Lindsay included a letter for Siyabonga in his native language expressing God’s love for him. These gifts of love opened the door for TTH staff to visit Siyabonga and his mother in their home. Truth was spoken over Siyabonga and his mom on that afternoon, and something was changed through the prayers lifted up for them. They responded to the invitation to go to church and are still coming a month later, hungry for more of the glimpse of Hope they have seen.